There seems to be three issues central to business ethics about which most people are confused: selfishness, altruism, and personal values. These are serious because they prevent people from acting ethically (and not just in business): achieving their values and flourishing. All three confusions are based on a thinking error, a fallacy, that Ayn Rand called a “package deal.” A package deal is a concept that lumps together two disparate elements, thus rendering the concept confusing and thus useless as a cognitive tool. The first of the three package deals is the idea of selfishness that fails to distinguish between genuine self-interest and cynical exploitation of others, thereby confusing people and making them view selfishness as negative. According to this package deal view, Jeff Bezos and Bernie Madoff belong to the same category: the selfish goal of both is (or was, in Madoff’s case) to pursue profits. However, Jeff Bezos is creating genuine value for Amazon’s customers and earning a profit by doing so, whereas Bernie Madoff is a predator who cynically exploited others for his own alleged gain. However, Madoff was not actually selfish. He was not creating any value, and therefore profits he made were not earned and not sustainable—and not in his self-interest. It is crucial to distinguish between genuine egoism and cynical exploitation of others, because we can only achieve values through the former. The latter is destructive—and therefore unethical—not only to the exploited victims but also to the exploiters, as Madoff’s case has clearly shown. The second confusing package deal is the notion of altruism that fails to distinguish between benevolence and kindness and the essence of altruism: self-sacrifice. Most people view altruism as positive and something that we should all practice consistently. However, altruism does not mean benevolence and helping those who deserve our help (that we can afford) and whom we want to help, such as people who have encountered disasters (accidents, illnesses, frauds, etc.) due to no fault of their own, or friends and loved ones. Such help is actually selfish because the recipients of help are values or potential values to us. For example, a company contributing (with a sum that does not jeopardize shareholder value) to the local United Way campaign stands to benefit from a healthier community (i.e., its customers) that such a campaign helps to build. But altruism rejects the pursuit of self-interest as evil and promotes selflessness or systematic self-sacrifice instead, camouflaging behind the feel-good notion of benevolence. 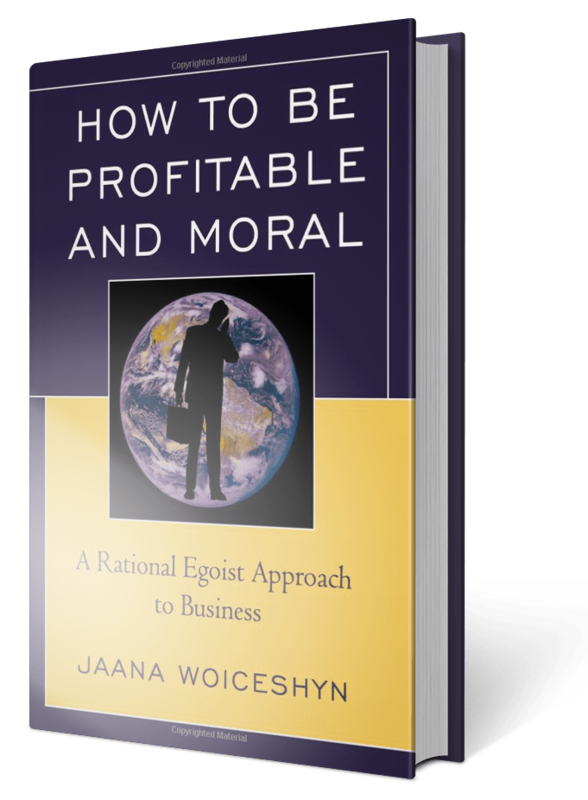 According to true altruism, profit making—and any other selfish value—is evil. Altruism is equally destructive as cynical exploitation: instead of promoting sacrificing others to oneself, it demands self-sacrifice for the sake of others. The third and perhaps the most subtle (but still harmful) confusion comes from packaging together subjective and personal values. When someone claims something to be a value—a fraud to save (or build) one’s business, say—that contradicts the requirements of human survival and flourishing, that value is subjective. (Only values that meet the requirements of human survival and flourishing, such as profit making through production and trade, are objective—the only kind we should pursue). The fact that a value is personal, such as a firmly held moral code, does not mean it is subjective. I have heard people criticize company CEOs for “imposing” their personal values on the companies their lead, suggesting that it “forces” employees to follow values with which they do not agree. However, before blaming CEOs for imposing their values, it is important to ask whether their values are subjective or objective—personal values can be either. Bernie Madoff was obviously pursuing subjective values, and getting others to follow them was destructive. But when a high-integrity leader, such as John Allison, former CEO of BB&T, “imposes” his objective personal values such as rationality and honesty on his organization—and employees voluntarily adopt them—it is a win-win. The company consistently creates value for its customers and shareholders, and employees are productive and happy. Only subjective personal values are destructive; objective personal values are consistent with human flourishing. The prerequisite of acting ethically in business and other realms of life is clear thinking—which is helped by being vigilant against package deals and other logical fallacies. Clear action can only follow from clear thinking. Next articleCapitalism versus the climate? Speaking of clear thinking, this is an excellent example, Jaana. Thank you!